Today starts our family’s countdown to Christmas. We celebrate the day by putting up the tree and preparing the nature table for the upcoming holiday. The nature table has been cleared of all Autumn’s findings and replaced with a blue silk and a path of 24 stars guiding Mary’s way. Sunday of each week something from the 4 kingdoms is added to the awaiting stable ready to greet Joseph and Mary Christmas eve. Week 1 is from the mineral kingdom, week 2 is from the plant world, week 3 animals, and finally the arrival of Joseph and Mary. The book basket has been updated to include all The Little’s seasonal favorites. This is how our family celebrates Advent. Tonight the countdown kicks off with the reading of the first Christmas story Counting To Christmas by Nancy Tafuri. Since we don’t celebrate Santa in our home finding new Christmas stories for Mama to leave out on St. Nicholas day can be a little hard. I thought I would make a list of our Christmas stories and welcome any new recommendations. Of course tellings of St. Nicholas and St. Lucia stories are also added on appropriate days. I am using this week’s Native American creation story to lead us into our Shelters block, How We Came To Be In This Room. Miss Sky finished reading If You Lived at the Time of Squanto by Anne Kamma. This leads us into talking about Wampanoag houses. The Wampanoag lived in round houses called a wetu. So today we decided to kick the block off with a wetu of our own. I wish I could say the idea was mine but I found the idea over at Our Little Nature Nest’s Blog. The instructions can be found here http://pepperpaints.com/2008/05/13/newspaper-hut/ We all worked together and the whole thing took less than an hour to make. People save their old newspapers for us to use as a fire starter in our wood burning stove. So the whole thing cost us nothing and can be recycled in our stove when The Little’s are done playing with it. But I have a feeling it will be around for a while. Wishing everyone a blessed weekend. This morning I was awoken by a “Little” nudge followed by a whisper “Mom when are we going to pick up our Turkey?” I noticed it was still dark outside and didn’t even want to see what time it was. Excitement that is usually saved for birthdays and Christmas has carried over into picking up the Thanksgiving turkey. Reassuring her that our turkey will still be there in a couple of hours I decided to get the day started. I knew today would be a short school day due to the outings and food preparations for tomorrow so I ran the days flow through my mind then got started on breakfast. I made eggs with toast scrambling 2 extra to make chicken fried rice for lunch. I also started my rice and cut up my veggies to be ready when we got back. After clean up we “finally” headed out . We have really enjoyed our farm visits and hope one day to have our own but until then we will continue to support our local farmers as long as we are able. Once home we started a short circle time focusing on Thanksgiving. Then went right into main lesson with Miss Sky coming up with her summary and writing it in her MLB. http://www.flickr.com/photos/24734949@N04/4134172199/ She finished looking up the last of her vocabulary words and I gave her a practice spelling test. She wrote the words she missed twice each and we took our break for lunch. We finished up the day with Miss Sky reading If You Lived at the Time of Squanto and I read The Market Square Dog by James Harriot. Another day successfully checked off the calendar. The Little’s excitement is hard to contain ok neither is Papa’s ,tomorrow is the day we go pick up our turkey. I was very serious about the countdown taking place in our household. This morning I let my mind wonder to all the up coming meals that one animal will provide for our family. This is why I feel so strongly about my children knowing exactly where their food came from. How much one takes for granted that at one time the food on their plate was a living creature that helped bring nourishment to our bodies. I again took the time to count my many blessings before starting on the steel cut oats that would be our breakfast. I also put my spaghetti sauce in the crock pot to simmer till lunch. We cleaned up our mess and started circle time. We continued working on lesson 5 with our penny whistles and Miss Sky is doing really well with her call and response. I am moving up and down the whistle now and she has a great ear for the notes. Keeping her back turned she can even repeat the many notes I am adding each time. We transitioned into beanbag with A Sailor Went To Sea, Sea, Sea and continued throwing the beanbag to the times tables. Starting first by saying the answers forward than backwards. Then I throw the beanbag saying 24 and Miss Sky throws it back saying 2 x 12. I add in addition and subtraction problems and some mental math too. Today Miss Sky told me the story back from yesterday during main lesson and she drew her picture in her MLB. I wrote her new vocabulary words on the board for her to copy. We wrapped up the day after lunch with storytime I read Blossom Comes Home from James Harriot’s Treasury for Children and Miss Sky started If You Lived at the Time of Squanto by Anne Kamma. The countdown has officially started here in our home. Yes soon the house will be filled with the delicious tastes and smells associated with Thanksgiving. Well I for one can’t wait. We most definitely have so much to be thankful for this year. During my meditation and prayer time this morning I took the time to really count my blessings. I find that when I start naming everything I am grateful for, all those little inconveniences don’t seem like such a big deal anymore. After my prayer of gratitude I started breakfast making pancakes with sausage. I prepared the hamburger soup that would later be our lunch. Miss Sky and I took care of our morning chores and while I hung the sheets out to dry I was thankful to have the smell of air freshened sheets at least once more this year. I sang our transition song calling the Little’s to gather for circle time and we stuck with the same line up as last week. We started lesson number 5 with our penny whistles and threw the beanbag back and forth practicing Miss Sky’s times tables. Today for main lesson I told the story of How The World Was Made a creation story from the Iroquois. Then gave Miss Sky her spelling words for the week. We marched out the spelling of each word then Miss Sky wrote them twice each in her MLB. Today for grammar I taught Miss Sky what a vigorous verb was by telling the story of Active Anna. 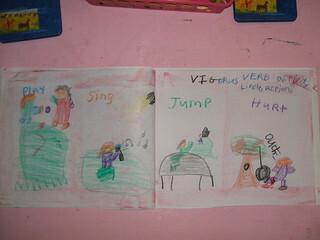 http://www.kyrene.org/schools/brisas/sunda/verb/1action.htm She then drew her picture in her MLB. I gave Miss Sky her new form for the week and tied it into the story of Chief Lawenio creating the clouds in the sky. I combined handwork and crafts today by using the materials we found on our scavenger hunt a couple weeks ago making pine cone people. Little Sis invited them to tea at faeries house during our lunch break. Where she said they were very happy. For storytime today Miss Sky read Small Wolf by Nathaniel Benchley and I read The Thanksgiving Story by Alice Dalgliesh. We wrapped up our day by starting a thankful jar which we will add our many blessings to the rest of the week. Wishing everyone peace and joy this holiday week. It was time to get our hands messy. After much brainstorming the Little’s decided it was time to get ready for the up coming holiday festivities with an old favorite http://www.recipezaar.com/Mexican-Wedding-Cookies-148688. Since these take awhile to bake I read another old holiday favorite An Old Fashioned Thanksgiving by Louisa May Alcott. This of course always ends with me having a “Little ” pretend feast of my own. After much thought on how to bring next weeks lesson I finally chose to bring Thanksgiving from the Native Americans point of view. I will tell the story I found on page 6 http://www.waldorflibrary.org/Clearing%20House/Spring%201978b.pdf. Then use this to lead us into How We Came To Be In This Room. This morning I woke up to find myself very unfocused to the day ahead. I tried to quiet my mind during meditation but found myself pondering the many thoughts running through my head. I have come to recognize these times as check ins. I grab my notebook and pen and start to write down the questions that seem to have my focus. How does our rhythm feel? Am I happy with this years flow? Are we falling behind? Are we doing too much? Have I seen improvement? What are we going to do about the holidays? It has always been easier to take the month of December off. I just realized that would mean next week would be our last lesson till January. We have always counted down the days of Christmas with activities centered around the holiday. Looking back at my past posts on planning out the year I find we are further behind then I like. I feel the flow has been spot on I am just questioning how it will all play out in the end. I took a little more time to jot down my thoughts and was glad to have left overs put back for a quick breakfast. Bringing my mind back into focus we started circle time. We continued reviewing past songs on the penny whistle and added in some rhythmic clapping. We transitioned into beanbag with the clapping rhyme A Sailor Went To Sea, Sea, Sea then tossed the beanbag back and forth to the times tables without clapping them first. I added in problems from the other processes as well. For main lesson I had Miss Sky repeat the steps to make a cloak while I copied them out on the board for her to write in her MLB. http://www.flickr.com/photos/24734949@N04/4116789726/ She looked up the last 5 of her vocabulary words and practiced this weeks form on her chalk board. Then I told her a new story How Flax Was Given To Man http://www.popularchildrenstories.com/stories/Kids-Nature-Stories-How-Flax-Was-Given-to-Men-0611.htm. I showed her a picture of flax and took her through the steps of how to weave linen. I also told her how the flax plant can be used for rope, wicks, and linseed oil as well as cloth. I showed her an example of what linen looks like. Then we compared the two different fiber textures. I combined todays spelling and grammar by having Miss Sky write a story using all her spelling words. Tomorrow I will write it out on the board for her to copy in her MLB then have her circle all the verbs on the board from her story. We wrapped up the day in front of the fire while Miss Sky read Molly’s Pilgrim by Barbara Cohen and I finished the story Mountain Born by Elizabeth Yates. Miss Sky loved this story and continued to talk about the rest of the night. I have a feeling we will be reading it again. This morning I found myself in a battle and hadn’t even left the bed yet. The soft sound of the rain hitting the ground lulled my mind to drift back into unfinished dreams. Little whispers coming from the other room let me know I had missed the opportunity for quiet time this morning. Pondering in my head the need of sun salutations when the sun decided to hide its self behind the clouds Steiner’s words of shaping the will ran through my mind. Yes a late reading of one his lectures had put me in this predicament in the first place. So it should be no surprise I was hearing his reprimands. How do I expect to shape my children’s will if I can’t even self-discipline mine. We live in such a fast pace world. People never seem to have enough time to sit down together as a family anymore let alone cook a meal. Days are over filled with so much stimulation we have become numb to the pleas of crying babes who crave the warmth of their home. Often people wonder why bees-wax modeling? Playdoh is much easier. Why hand stitch when there are sewing machines? Wouldn’t it be simpler to buy your children’s gifts ,I mean you can’t make all of them? After realizing where I don’t want to be I decided sun salutations didn’t sound so bad after all. I even enjoyed the company. I got stated on potatoes , bacon, and eggs for breakfast. Maybe it’s the visits to all the farms but Miss Sky has found a liking to over easy eggs and has requested them everyday this week for breakfast. Together we cleaned up our morning mess and started circle time. We continued our penny whistle music review and stuck to the same clapping and bean bag routine as yesterday adding in a few more mental math problems. Today for main lesson Miss Sky taught me how to make a cloak. I explained why shearing the dog to use for her presentation was out of the question. After running me through all the steps and the dogs hair still in tact she drew her picture in her MLB. I then wrote her new vocabulary words on the board. She looked the first five up in the dictionary. Grammar today Miss Sky circled all the nouns from her spelling list and underlined the verbs. For Spelling and form drawing she practiced her words and form in corn meal. We worked with our drop spindle today. I found a great tutorial on YouTube http://www.youtube.com/watch?v=7gXTWgMeMgI. I read Mountain Born and Miss Sky read The Adventures of Obadiah by Brinton Turrkle for today’s storytime. After a wonderful week of celebration with the Little’s, it is time to get focused back to our school work. We took advantage of the light week and downsized our home a little more. It seems we always have an ongoing bag of donations but this time we really cleaned house. Papa and I have come to an agreement if we can’t find the time to take care of it get rid of it. I use my grandmother’s house as my example. She had a cozy 3 bedroom ranch type house. Living during the depression taught her how to save and spend her money buying only what was needed to live. It was free of knick-knacks and excess furniture. She had certain days she would do things outside or around the house and Friday’s was cleaning day. I loved grabbing a dust rag and polishing up the furniture by her side. So this week we went through and rid ourselves of unwanted clutter. Man, it feels SO good. This morning during meditation time my mind felt as clear as our house. I ran the flow of the day through my mind making sure it followed the “in and out” breathing pattern. While the Little’s dressed and started their chores I made waffles with smoke sausage for breakfast. I also put my ingredients for chili in the crockpot to simmer till lunch. After clean up, we transitioned into circle time lighting the morning candle then singing We’ll All Join In A Circle followed by prayer. Here is the rest of this months circle. We reviewed all the songs we learned so far on our penny whistle’s and worked on the ones that still give us trouble. We took turns trying to make the bean bag in the basket with our feet changing right to left. Then we clapped out the 2, 5, and 10 times tables. Afterwards, we threw the bean bag back and forth reviewing problems from the 4 processes. For main lesson this week we will have (2 )3-day rhythms. Introducing the fiber wool today and Flax at the end of the main lesson on Wednesday. I had Miss Sky recall the last story I told of Jacob and Esau., I asked since Esau was a hunter and Jacob was a shepherd what fiber to you think their clothes were made of? I introduced the 5 fibers we will be studying this year wool, linen, leather, silk, and cotton and showed her examples of each. We looked at the tags of our clothes we had on checking to see what they were made of. Then I let her feel some polyester fiberfill. We talked about how the other 5 were taken from nature and I explained during Old Testament time clothes were either made from plants or animal hair. We talked about the steps one takes to get enough thread to make a cloak. Then I gave Miss Sky her spelling words and we marched out the spelling of each one. Miss Sky wrote them in her MLB. For grammar, I taught Miss Sky what a verb was. I drew a picture to go along with this poem on page 10. http://www.waldorflibrary.org/Clearing%20House/Spring%201969.pdf . Miss Sky drew her picture and copied part of the poem in her MLB. http://www.flickr.com/photos/24734949@N04/4110954438/ Then we practiced her form drawing for the week on the board, in the air, and on each other back. After our lunch break, we worked on winding our wool roving in a ball to spin tomorrow. Then Miss Sky read Charlie Needs A Cloak by Tomie Depaola and I continued reading Mountain Born. Wishing everyone a happy Monday. The Little’s were free for a day of play. Then at sundown, it was time for our walk. It couldn’t have been a better night for a walk under the stars. Back indoors we enjoyed leftover gingerbread from yesterday. I wrapped up the night telling the story of Martin’s Lantern from Festival of stones for bedtime letting them take it to dreamland. Wishing everyone peace and warmth for the upcoming season.